Socket modules and socket cards are the electro-mechanical interface between the programmable semiconductor device and the programmer. 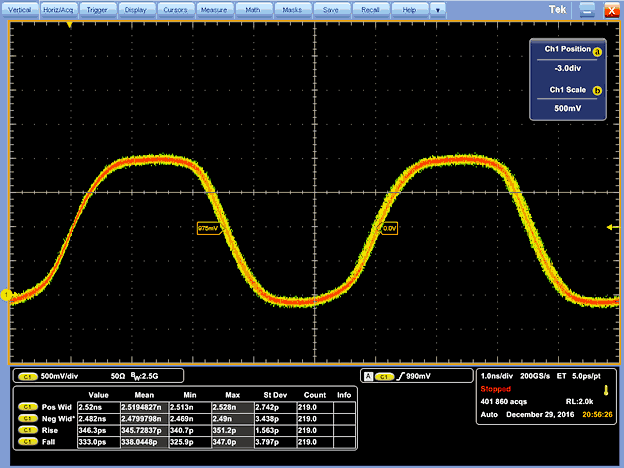 The robust design is ideal for manufacturing and design environments where high signal integrity and reliable performance are critical. The sophisticated technology of BPM Microsystems’ active circuitry delivers the cleanest waveform signals to the device by eliminating noise, ground bounce, and overshoot, which allows for the most reliable vector testing available to ensure the highest quality and overall yield. BPM Microsystems offers a substantial number of socket modules and socket cards to support thousands of devices from over 218 semiconductor manufacturers. New socket module and socket card designs are continuously added and can be developed quickly to meet your programming needs. Our socket modules and socket cards provide you with the best combination of programming quality and cost of ownership. Unlike our competitors, you can order as many socket solutions as you need– even if it’s only one! Contact us with regards to your specific needs. Good: Receptacle based sockets can be purchased and replaced (after passing their insertion rating) without the need to use any tools. Why spend extra to replace the whole socket module or Device card? Better: High Insertion Count (HIC) and long life sockets will run hundreds of thousands of insertions without the need to replace components. When you literally can’t send a repair tech— We support devices that are used in high-reliability mission-critical applications (such as aerospace and automotive) which requires the highest quality programming equipment. Microsemi develops chips that cost over $50K each that must meet excruciating standards for durability and longevity. Their programmer solution provider? BPM Microsystems, of course. Demanding– We support many complex devices that use sophisticated protocols and need a large number of pin drivers and a significant amount of power. 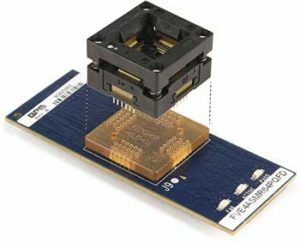 Parallel Mode– BPM’s Automated programmer provides 240 high-speed pin drivers that enable us to support devices in parallel mode (faster) compared to serial (slow). Efficient and Flexible DDS– Device Driven Serialization (DDS) is a communication framework that allows the External Serialization Server (ESS) to communicate bi-directionally with a device-specific programming algorithm running as part of the programming application. This allows the ESS to become part of the programming algorithm and extends the functionality of typical serialization techniques and offers high flexibility in supporting sophisticated security devices. HIC (High Insertion Count) sockets, also known as long-life sockets are designed for customers with high volume production requirements who aim for maximum programming yields. These sockets are rated from 200,000 to 300,000 insertions and support multiple package types. In addition, pogo pins can be replaced to extend the life of the socket. Ultimately, our HIC sockets ensure productivity, long-term reliability, and very low operating cost per insertion. Socket cards offer the shortest return on investment on a cost-per-device basis. The unique design of individual socket cards and receptacle-base socket option further reduce the programming cost per device. 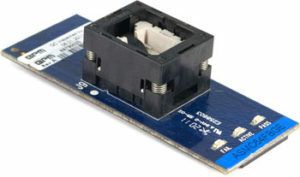 Socket cards support high-density NAND Flash, NOR Flash, Serial Flash, MCU’s, E/EPROM and more. Get the most out of your socket module with our individual replacement socket daughter cards. Unlike our competitors’ “gang” cards that are soldered to a common PCB, our customers can optimize the number of socket daughter cards needed and replace them individually without dramatically affecting programming capacity. This fault-tolerant design increases manufacturing up-time and saves replacement costs by as much as 75 percent. Our receptacle-base socket modules and socket cards include a receptacle interface between the printed circuit board and the socket. This allows our customers to replace only the individual consumable socket once it reaches its useful life. This has proven to extend the life of the socket module and socket card, producing higher yields and lowering programming cost per device. Socket modules available for 7th, 8th, and 9th Generation Programmers– just provide us with a sample to allow in-house testing. Save time and Money!